Abacus Healthcare, has presented a cuddly ‘Trevor the Turtle’ to Ola Driver from Newcastle upon Tyne who won its competition at the DNEX exhibition at Newcastle Racecourse. We exhibited our assisted baths, postural supports and services at the DNEX exhibition. 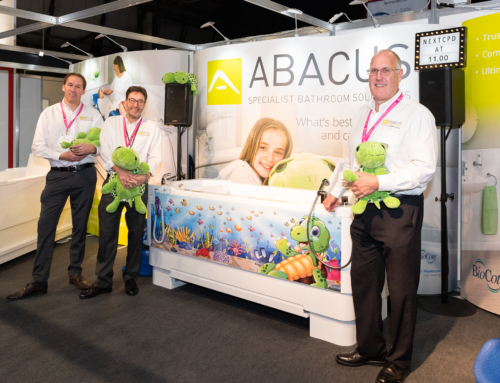 The friendly and highly experienced Abacus product specialists also provided the opportunity to win the Abacus Mascot – Trevor the Turtle. This free prize draw was entered by Ola aged 3 who subsequently won. (16 Nov) and The OT Show (22-23 Nov).